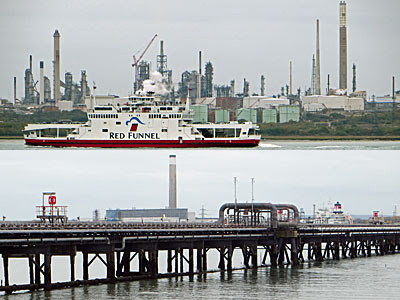 The River Hamble is a waterway of a more manageable size, and full of yachts. [No really, I've never seen so many yachts and motor cruisers all berthed together, at piers and pontoons along the entire lower length of the river. It being a dull Friday there weren't so many out on the water, but my word this inlet is perfect for the Solent and a nice sail out to Cowes, and probably a bit of a millionaires' playground into the bargain.] Near the mouth of the river is the charming village of Hamble-le-Rice, its steep curving high street lined with desirable food and drink options for yachtspeople. [I was hoping for fish and chips, but went hungry. The main square seems to be mostly bus turnaround and car park, but boasts its own gold postbox, so that's all good.] 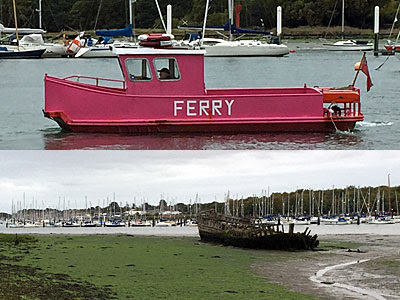 This is also the departure point for the Hamble Ferry, an exceptionally pink craft which runs on demand from the pier on The Hard. A continuation of a service known to have run in medieval times, a crossing costs little more than a guinea and seats twelve. There were two of us on my voyage, which I think counts as rush hour, as we weaved between masts and buoys to the exceptionally pink Ferry Shelter on the opposite bank.